It’s not always easy being the second child. Especially as he’s the same gender as his big brother, though in fairness I don’t think much would have changed had he been a girl. I would say that there’s not a day that goes by where B isn’t dressed in something that was his big brother’s….or cousin’s! And as for toys? Well, G’s “big kid” toys have well and truly taken over, and being totally honest, I haven’t made the effort to make space for any baby stuff. But now that B is starting to show more interest and move about a bit more, it’s only fair to give him his share too. Thankfully we were sent a couple of new toys from the In The Night Garden Baby range to give him his very own toys that he hasn’t had to thieve from big bro! They’re really lovely toys. The characters that we are very familiar with (in this house at least) have had a slightly mellow makeover, making them slightly more gentle and pastel coloured, as well as being super soft, just perfect for little ones to grab (and chew!). Upsy Daisy has a handy Velcro tag, brilliant for attaching to the car seat or pushchair bar to keep them amused on the go. Her skirt is made from ribbon tags which B loves playing with and sucking on, and she has a gentle bell rattle that he loves, but isn’t so loud as to drive me round the twist every time he launches it! 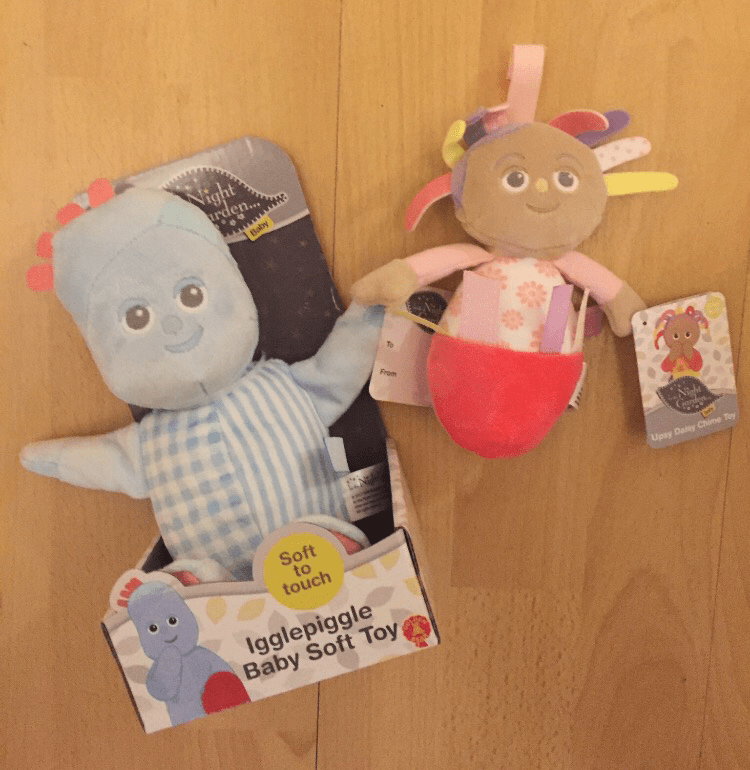 Iggle Piggle is the softest toy. He’s so lovely and cwtchy, B has loved snuggling up to him at nap time, and G has had to “borrow” him once or twice too. He also features a gentle bell rattle, noisy enough to amuse. It not obnoxious enough to wake anyone up. B loves grabbing at his hands and feet too which crinkle when pressed. Iggle Piggle has become a firm friend…poor sod can’t escape from the army crawler now no matter how far he’s been flung haha! I’ve had few “technical” issues (probably because I’m terrible with technology!) getting the photos of B playing with his new friends to upload, but I’ve been trying to get this review up for ages so I wanted to get it posted and tell you all about them. I’ll update this with a few more pics soon, or keep an eye out on my social media channels to spot them! Do your littles have a cuddly bff? « It’s Time to Wean!